Last week I blogged about a research discovery. An influential study had found that a 1980 wave of Cuban refugees into Miami, known as the Mariel Boatlift, had caused the wages of workers there to fall dramatically. In a new paper co-released by CGD and the National Bureau of Economic Research, my co-author and I revealed that large shifts in the racial composition of the underlying survey data could explain most or all of the same fall in wages. In other words, we found that that the evidence was insufficient to prove that the influx of Cubans caused the fall in wages of Miami workers. The author of the previous study, George Borjas, raised two substantive questions about our research, which I answer briefly in this post. (A more technical supplement is here.) The changes in sample composition do coincide with the relevant changes in wages, and our results stand up within precisely the regression framework used by Borjas. This reinforces our paper’s main finding: that the Borjas study’s finding of large, robust, highly significant effects on low-skill workers’ wages was spurious. However, nothing here disproves any negative wage effects of the Mariel Boatlift; some of the evidence is compatible with negative effects, but it is also compatible with zero effects. Borjas notes that, in the data he uses, the increase in the fraction of black workers for 1979 is not accompanied by a fall in the average of wages earned in that year. This is true, but not relevant. The sample in each year is miniscule: in that year it’s just nine black workers, and eight non-blacks. Any result will fluctuate unpredictably from year to year. What matters for the regressions in Borjas’s paper is that the black fraction of the sample is far higher in the years when the average wage is lower (as shown in the graph below). This has the effect of artificially reducing the average wage post-Boatlift (in blue) relative to pre-Boatlift (in red). Borjas’s argument amounts to claiming that the above, obviously negative relationship is entirely coincidental. It has a simpler explanation: adding low-wage blacks to the sample must, arithmetically, create a large spurious treatment effect. (David Roodman makes a related point here.) The only question is whether that spurious effect is large enough to explain the entire effect in the regressions of Borjas’s paper. I turn to that now. Our paper already runs regressions to test how much of the wage decline could have been spurious, by controlling for a black indicator variable (Figure 4, page 35 of our paper). Those regressions have a different form than the main regressions in Borjas’s paper (his Table 5). In Table 1 below, I reproduce our results in precisely the regression framework used by Borjas. 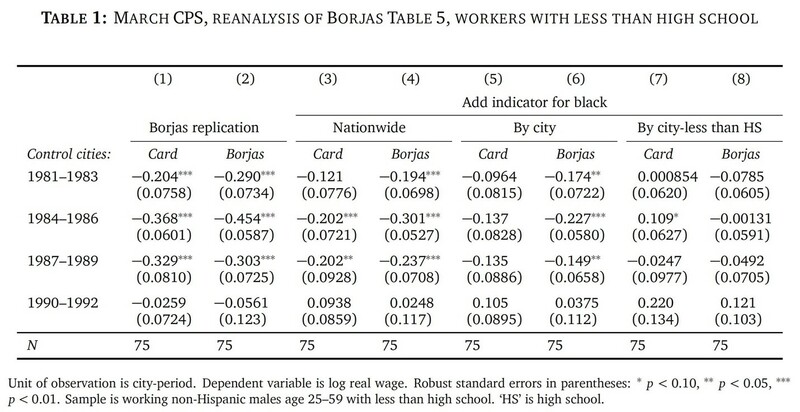 Miami wage trends for non-Hispanic men with less than high school are compared to trends in two groups of ‘control’ cities: those preferred in the research by Borjas and those preferred by David Card (whose influential study in 1990 found no negative wage effect of the Cuban immigrants, and was disputed by Borjas). Negative numbers mean that wages for workers with less than high school-level education were lower in Miami after the Boatlift, relative to unaffected ‘control’ cities. The first column is an exact replication of Table 5 in the Borjas paper, for one extract of the Current Population Survey (CPS) data: the March CPS. In our paper, we claimed that the negative effects of columns 1 and 2 could be explained by a jump in the share of black respondents in the March CPS coinciding with the Boatlift, but unrelated to it. Columns 3 and 4 use wages from which the effect of a black indicator has been removed, in the same way as in the blog by Borjas, exactly replicating those results. About one third of the treatment effect disappears—but, as Borjas noted, not the entire effect. However, unlike the analysis in our original paper, but following Borjas’ blog post, columns 3 and 4 impose the strong assumption that the wage gap between blacks and non-blacks is identical in every city, at all levels of education. This is unlikely given that 63 percent of the sample is black in Miami, but under 10 percent in the Borjas control cities. In our paper we show that the difference between black and non-black wages is indeed different in Miami than in other cities. And, as shown in our original blog post, the shift in composition of the sample only happened in Miami. Columns 5 and 6 therefore remove the black effect from wages allowing the black effect to differ between cities, but not between education levels. More than half the treatment effect is gone now, and the treatment effects are statistically insignificant relative to the Card control cities. Since the large shift in the black fraction of Miami’s sample occurs only for workers with less than high school, in columns 7 and 8 of the table, we remove the black effect specifically for workers with less than high school. There is no wage effect relative to the Card control cities. We cannot reject an effect relative to the Borjas control cities, of –5 to –8 percent. But amid the statistical noise, we cannot reject a zero effect either. This result corresponds closely to Figure 4d (page 35 again) in our paper; the only material difference is that we did not control for workers’ age in that figure. As we discuss at length in our paper, there’s an important caveat to the above findings. It is hypothetically possible that the entire effect of the Mariel Boatlift fell upon black men with less than high school education, not on Hispanics and not on whites or Asians at that education level, or any workers who finished high school. This is unlikely, but cannot be definitively ruled out. If that is the case, columns 7 and 8 in the above tables control away the effect of interest. 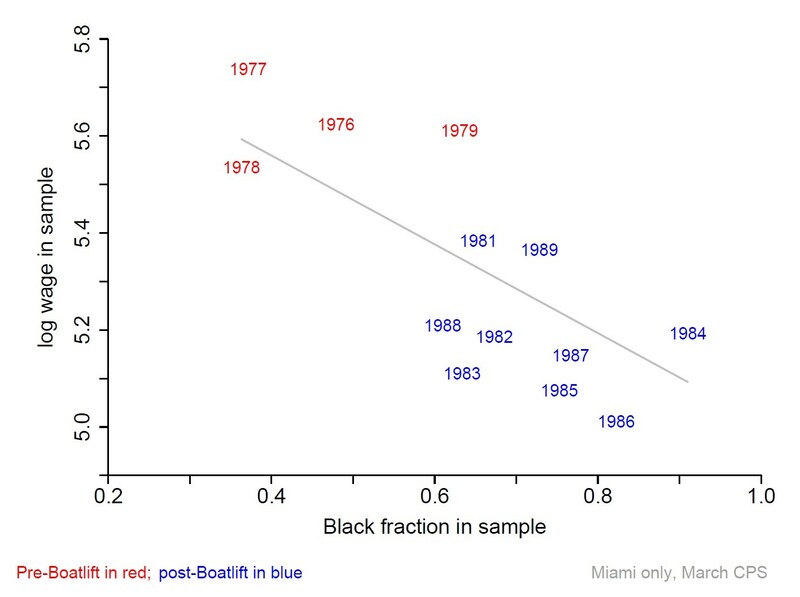 By allowing the black indicator to take a Miami-specific value for black workers with less than high school, columns 7 and 8 are effectively measuring the effect of the Boatlift on non-Hispanic whites and Asians. If the effect on blacks in that skill group was far greater, that differential effect would be missed by those regressions. In Table 2, below, I repeat the analysis using the Outgoing Rotating Group (ORG) data, a larger and thus more reliable CPS extract that represents the same population. The treatment effect disappears even when allowing the black indicator to vary only by city—not by education level. Thus even without allowing a different black effect by education level, the negative treatment effect is only present in one (smaller) dataset but not another; and in the dataset where the effect appears, it is present relative to Borjas’s chosen control cities, not Card’s. This and several other pieces of evidence are discussed in the supplement to this post. The evidence from the Mariel Boatlift does not offer a compelling reason to revise the consensus among research economists that the effect of immigration on native wages is small, even for native workers without a high school degree. This is fundamentally different from proving that the Mariel Boatlift did not reduce wages for that group: no such proof exists. In one dataset but not another, and for some control cities but not others, there is evidence that is compatible with a wage effect of –2 to –8 percent at some points in time. But even there, the evidence is also compatible with a wage effect of zero or above. This certainly does not disprove any wage effect, but it does imply, as we concluded in our original paper, that the Borjas study’s finding of large, robust, highly significant effects on low-skill wages was spurious. Our contribution has been to show that slicing the available data too finely can introduce severe bias by creating unrepresentative subsamples. The surviving data from the Mariel Boatlift have now been pushed as far as they will go, and they have little more to tell. I originally blogged to accessibly summarize research that we had spent several months carrying out. We are grateful for the substantive comments and questions our work raised, and will continue this debate carefully and slowly, in the dispassionate academic manner that it deserves. The code to replicate this analysis is here. I thank three anonymous referees for helpful suggestions, and George Borjas for making his regression code publicly available. La semana pasada blogueé sobre un descubrimiento. Un influyente estudio había descubierto que una ola de refugiados cubanos en Miami en 1980, conocida como el Éxodo del Mariel, había causado que los salarios de los trabajadores cayeran dramáticamente. En un nuevo artículo publicado conjuntamente por la CGD y la Oficina Nacional de Investigación Económica, mi coautor y yo revelamos que cambios grandes en la composición racial de los datos subyacentes podrían explicar la mayor parte o toda la caída de los salarios. En otras palabras, encontramos que la evidencia era insuficiente para demostrar que la afluencia de cubanos causó la caída de los salarios de los trabajadores de Miami. El autor del estudio anterior, George Borjas, planteó dos cuestiones sustantivas acerca de nuestra investigación, a las que respondo brevemente en este post. (Un suplemento más técnico aquí.) Los cambios en la composición de la muestra coinciden con los cambios relevantes en los salarios, y nuestros resultados se destacan precisamente en el marco de regresión utilizado por Borjas. Esto refuerza el hallazgo principal de nuestro trabajo: que el hallazgo del estudio de Borjas de efectos grandes, robustos y altamente significativos sobre los salarios de los trabajadores poco calificados era espurio. Sin embargo, aquí nada refuta cualquier efecto negativo sobre los salarios a partir del Éxodo del Mariel; parte de la evidencia es compatible con ciertos efectos negativos, pero también es compatible con efectos nulos. Borjas señala que, en los datos que utiliza, el aumento de la fracción de trabajadores de raza negra en 1979 no viene acompañado por una caída de los salarios promedio en ese año. Esto es cierto, pero no es relevante. La muestra en cada año es minúscula: en ese año son hay nueve trabajadores de raza negra y ocho de raza no negra. Cualquier resultado fluctuará de manera impredecible de año en año. Lo que importa para las regresiones en el artículo de Borjas es que la fracción de personas de raza negra de la muestra es mucho más alta en los años en que el salario promedio es menor (como se muestra en el gráfico siguiente). Esto tiene el efecto de reducir artificialmente el salario promedio después del Éxodo (en azul) respecto al período antes del Éxodo (en rojo). El argumento de Borjas equivale a afirmar que la relación mencionada arriba, obviamente negativa, es totalmente casual. Esto tiene una explicación más sencilla: la adición de personas de raza negra de salarios bajos a la muestra debe, por aritmética, crear un gran tratamiento espurio. (David Roodman hace un punto relacionado aquí.) La única pregunta es si ese efecto espurio es lo suficientemente grande como para explicar todo el efecto en las regresiones del artículo de Borjas. Me dirijo a eso ahora. Nuestro trabajo ya corre regresiones para probar cuánto de la caída salarial podría haber sido espuria, controlando por una variable dummy para trabajadores de raza negra (Figura 4, página 35 de nuestro trabajo). Estas regresiones tienen una forma diferente a las principales regresiones del trabajo de Borjas (su Tabla 5). En la Tabla 1, reproduzco nuestros resultados precisamente en el marco de regresión utilizado por Borjas. Las tendencias de los salarios de Miami para hombres no hispanos con educación menor a la secundaria se comparan con las tendencias en dos grupos de ciudades ’control’: las preferidas en la investigación de Borjas y las preferidas por David Card (cuyo influyente estudio en 1990 no encontró efecto salarial negativo de inmigrantes cubanos, y fue disputado por Borjas). Los números negativos significan que los salarios de los trabajadores con educación menor a la secundaria fueron menores en Miami después Éxodo, en relación con las ciudades "control" no afectadas. La primera columna es una réplica exacta de la Tabla 5 en el documento trabajo de Borjas, para un extracto de los datos de la Current Population Survey (CPS): el CPS de marzo. En nuestro artículo, afirmamos que los efectos negativos de las columnas 1 y 2 podrían explicarse por un salto en la proporción de encuestados de raza negra en el CPS de marzo coincidiendo con la llegada del Mariel, pero sin relación con el mismo. Las columnas 3 y 4 usan los salarios de los cuales se ha removido el efecto de variable dummy para personas de raza negra, de la misma manera que en el blog de Borjas, replicando exactamente esos resultados. Alrededor de un tercio del efecto del tratamiento desaparece--pero, como Borjas señaló, no todo el efecto. Sin embargo, a diferencia del análisis en nuestro trabajo original, pero después del blog de Borjas, las columnas 3 y 4 imponen el fuerte supuesto de que la brecha salarial entre personas de raza negra y no negra es idéntica en todas las ciudades, en todos los niveles educativos. Esto es improbable dado que el 63 por ciento de la muestra es de raza negra en Miami, pero menos del 10 por ciento en las ciudades de control de Borjas. En nuestro trabajo mostramos que la diferencia entre los salarios de trabajadores de raza negra vs de raza no negra es realmente diferente en Miami que en otras ciudades. Y, como se muestra en nuestro blog original, el cambio en la composición de la muestra sólo ocurrió en Miami. Por lo tanto, las columnas 5 y 6 remueven el efecto de ser un trabajador de raza negra de los salarios, permitiendo que el efecto varíe entre ciudades, pero no entre niveles educativos. Más de la mitad del efecto del tratamiento desaparece, y los efectos del tratamiento son estadísticamente no significativos en relación a las ciudades de control de Card. Dado que el gran cambio en la fracción de trabajadores de raza negra de la muestra de Miami ocurre sólo para los trabajadores con educación menor a la secundaria, en las columnas 7 y 8 de la tabla eliminamos el efecto de ser un trabajador de raza negra específicamente para los trabajadores con educación menor a la secundaria. No hay ningún efecto salarial en relación con las ciudades control de Card. No podemos rechazar un efecto relativo a las ciudades control de Borjas, de -5 a -8 por ciento. Pero en medio del ruido estadístico, tampoco podemos rechazar un efecto nulo. Este resultado corresponde de manera muy cercana a la Figura 4d (página 35 de nuevo) en nuestro trabajo; la única diferencia sustantiva es que no controlamos por la edad de los trabajadores en esa figura. Como discutimos extensamente en nuestro artículo, hay una salvedad importante para las conclusiones anteriores. Es hipotéticamente posible que todo el efecto del Éxodo del Mariel cayera sobre los trabajadores de raza negra con educación menor a la secundaria, no de los hispanos y no de los blancos o asiáticos en ese nivel educativo, ni en los trabajadores que terminaron la escuela secundaria. Esto es improbable, pero no puede ser descartado. Si ese es el caso, las columnas 7 y 8 de las tablas anteriores controlan por el efecto del interés. Al permitir que la variable dummy por ser un trabajador de raza negra tome un valor específico de Miami para los trabajadores de raza negra con educación menor a la secundaria, las columnas 7 y 8 están midiendo efectivamente el efecto de la llegada del Mariel sobre blancos no hispanos y asiáticos. Si el efecto sobre los trabajadores de raza negra en ese grupo de nivel educativo era mucho mayor, ese efecto diferencial sería perdido por esas regresiones. En la Tabla 2, a continuación, repito el análisis utilizando los datos del Outgoing Rotating Group (ORG), un extracto de CPS más grande y, por tanto, más representativo de la misma población. El efecto del tratamiento desaparece incluso cuando se permite que variable dummy varíe sólo por ciudad--no por nivel educativo. Así, incluso sin permitir un efecto por ser un trabajador de raza negra diferente por nivel educativo, el efecto negativo del tratamiento sólo está presente en un conjunto de datos (más pequeño) pero no en otro; y en el conjunto de datos donde aparece el efecto, está presente en relación a las ciudades control elegidas por Borjas, no las de Card. Este y varios otros elementos de evidencia se discuten en el suplemento a este post. La evidencia del Éxodo del Mariel no ofrece un caso convincente para revisar el consenso entre los economistas de la investigación investigadores de que el efecto de la inmigración sobre los salarios nativos es pequeño, incluso para los trabajadores locales sin un título de escuela secundaria. Esto es fundamentalmente diferente a probar que el Éxodo del Mariel no redujo los salarios para ese grupo: no existe tal prueba. En un conjunto de datos pero no en otro, y para algunas ciudades control, pero no otras, hay evidencia que es compatible con un efecto de salario de -2 a -8% en ciertas instancias. Pero incluso allí, la evidencia es también compatible con un efecto salarial de cero o más. Esto ciertamente no refuta ningún efecto salarial, pero sí implica, como concluimos en nuestro artículo original, que el hallazgo del estudio de Borjas de efectos grandes, robustos y altamente significativos sobre salarios de baja cualificación era espurio. Nuestra contribución ha sido mostrar que dividir la data disponible muy finamente puede introducir un sesgo severo mediante la creación de sub-muestras no representativas. Los datos que quedaron del Éxodo del Mariel han sido empujados hasta el límite, y tienen poco más que contar. Originalmente blogueé para resumir de manera accesible la investigación que habíamos pasado varios meses realizando. Agradecemos los comentarios sustantivos y las preguntas que plantea nuestro trabajo, y continuaremos este debate lenta y cuidadosamente, con la imparcialidad académica que merece. El código para replicar este análisis se encuentra aquí. Doy las gracias a tres árbitros anónimos por sus sugerencias útiles, y a George Borjas por hacer su código de regresión disponible públicamente.